Harav Michael Goll, Rosh Yeshiva of the Yeshiva Maginei Eretz, and one of the first students of Rav Eliezer Berland, shlita, told us an amazing story that happened to him when he was a young avreich. One day, he travelled to Meron, and while he was there he met a Jew who he described as a real oved Hashem (servant of Hashem), who was a Lelover Chassid. The two men began to speak, and as they continued to talk, Rav Goll started to understand that the Jew he was talking to actually grasped the greatness of Breslev Chassidut, that this particular Chassidut was very special - but with one caveat: He opined that today's Chassidut Breslev wasn't the same, authentic Breslev as of years' past. When Rav Goll heard this, he asked him: "Do you know Rav Eliezer Berland?" And he replied: "Yes! He truly remains authentic, and is something very special." 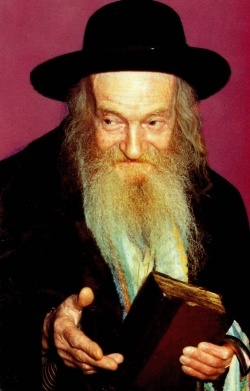 The Lelover chassid continued that the Admor Hagadol of Lelov Chassidut, Rav Moshe Mordechai z"l (1903-1987), had said about Rav Berland, that he's the greatest servant of Hashem in this generation. Rav Goll then asked him: "Did you hear him say this with your own ears?" The Lelover Chassid replied that he had, and then he went on to tell over other great things he'd heard with his own ears from the Lelover Admor, about Rav Berland. "That was Rebbe Alter Biderman, the son of the Admor of Lelov." Rebbe Alter z"l, himself was an Admor of Lelov for many years, until he unexpectedly died and in the year of 5761, leaving behind him a number of sons, all of whom were tsadikim. Today, two of these sons are Admorim in their own right. One son is the Rosh Yeshiva of Panim Meirot, Rav Chaim Yosef Biderman, and another two sons, Rav Elimelech and Rav Nachman Biderman, are also very influential figures in the Torah world. We received a message on the information line from one of the more prominent Lelover Chassidim, who said that Rav Moshe Mordechai z"l had been a very holy, pure man and that he was believed to have had ruach hakodesh. And that many modern-day Tsadikim said that Rav Moshe Mordechai was a soul from the earlier generations. If that's what he said, then who are we to even contemplate saying anything different? "Floating city" over China or Beis Hamikdash (Third Temple) falling from heaven? Judge for yourselves! It is now official! - Rabbi Eliezer Berland shlit"a has "dissapeared". Listen - Head of police investigation admits "they asked me to forge a false case on Rabbi Berland"
The Tzadik is coming home! Who are the soldiers of Gog Umagog?